Rock Gods KISS have teamed up with the quality-at-all-costs design community, www.BandJob.com, for a no-holds-barred Design Brawl to create the next iconic KISS t-shirts. 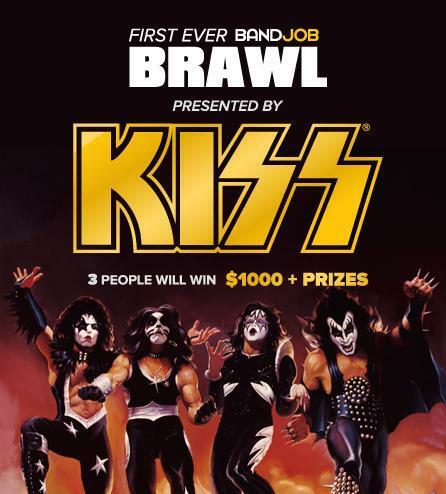 The THREE designers left standing at the end of this Brawl will each receive $1,000 cash, two tickets to see KISS live in concert, a chance to meet the band, and a print of their winning design signed by Gene Simmons and Paul Stanley! Professionals and amateurs alike are welcomed to submit their best work. Head over to www.BandJob.com to find out more and submit your design! Don't design? You can still have a hand in choosing your next favorite KISS shirt. Sign up for an account at www.BandJob.com and vote for the entries you want to wear! Band Job is an online community created by and for professional designers working in the music industry. It's a place to showcase your work, talk shop, and learn from the best in the business. Not a designer? Band Job is a great place for all enthusiasts and supporters of visual arts in music. Learn more about the art behind your favorite bands. Check out great merch designs, awesome album covers, and other amazing art from the best designers in the music industry.